Planes, trains, and automobiles? In Orlando, that’s not quite right. For Walt Disney World visitors, let’s revise the old transportation adage. How about monorails, Magical Express, and Minnie Vans? Or perhaps ride-sharing, shuttles, and rental cars? Disney transportation can be both overwhelming and overwhelmingly convenient. But you need to know how to use the system. Find out everything you need to know to master Disney World transportation, both on and off-property. One of two Disney monorails. Walt Disney World is a pretty enormous place. That means transportation is an essential part of the experience. Most new visitors are completely overwhelmed by the choices. How can you best make use of Disney transportation? Don’t worry – that’s what this guide is for! From buses to rental cars to monorails and more, there is a myriad of choices. Here is everything you need to know about transit and the transportation systems around Walt Disney World. 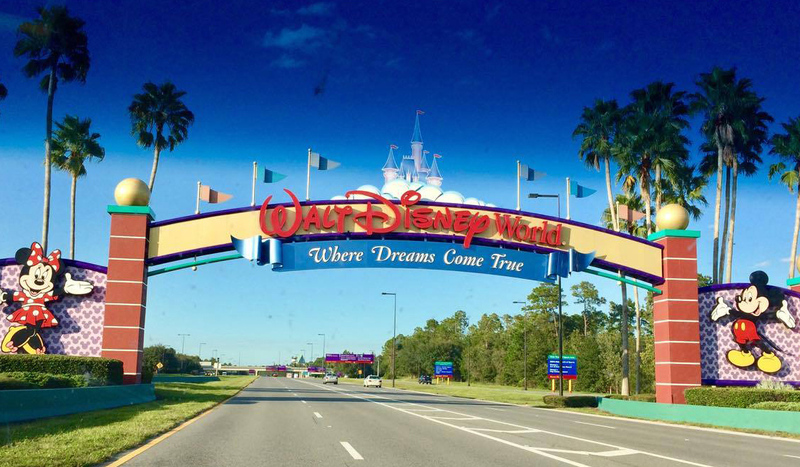 First things first – getting to Disney World! While for many travelers that is as simple as a road trip, many others need to fly to Orlando to start a Disney vacation. For guests flying into Orlando International Airport, that’s where the Disney transportation may start for you. All aboard the Magical Express to and from the airport. Disney offers the Magical Express for all guests staying in a Disney resort hotel. The Magical Express is a free motorcoach transfer to Disney resort hotels. It’s easy to use, but booking it and making the most of its free checked bag delivery service requires some pre-trip planning. Don’t miss TravelingMom’s guide to using the Magical Express for all the important details. TravelingMom Tip: Magical Express is only offered to guests arriving into MCO. If you fly into Orlando Sanford (served by Allegiant Airlines), you’ll need to find your own transportation. Check those airport codes! If you aren’t staying in a Disney resort hotel, you’ll have to find your own way from the airport to your hotel. Taxis and shuttles are available, as are rental cars. At long last, ridesharing services like Uber and Lyft can finally operate at MCO too. Uber and Lyft usually offer substantial savings over taxi rates (about $50 to the Disney World area in a standard car vs. approximately $80 for cab fare). Once you are on the property, Walt Disney World offers a number of different transportation options. The Disney transportation system covers over two dozen hotels, four theme parks, two water parks, the Disney Springs area, and more. The most common form of transportation is buses. Ferries and the well-known monorails serve quite a few locations as well. The system is entirely free to use, whether you are staying at a Disney resort hotel or off-property. TravelingMom Tip: If you are traveling with a baby or toddler, think carefully about your stroller and transit. You must fold your stroller before boarding buses and ferries (but not usually monorails). Can you do that while juggling a young child and whatever bags you have with you? Make sure to choose a travel stroller that works! The network of buses at Walt Disney World is so extensive that new visitors are best served to study a map. A convenient shorthand to know is that buses run from nearly every Disney resort hotel to each of the four parks at least. The major exception is for hotels on the monorail loop (you can reach the Magic Kingdom via monorail instead). Buses also run regularly between and among all the parks. TravelingMom Tip: At Disney Springs? There are no buses that will take you directly to the four theme parks. A connection at a hotel is required. Buses serve nearly every Disney destination. Walt Disney World has two monorails. One serves the hotels on the Magic Kingdom monorail loop: Disney’s Polynesian Village Resort, Disney’s Grand Floridian, and Disney’s Contemporary Resort. It connects at the Transportation and Ticket Center to the second monorail that goes directly to Epcot. Disney’s fairly extensive water transportation system is occasionally overlooked. The buses and the famous monorails loom larger. But water taxis and ferries can be a smart choice too. They offer a peaceful and often less crowded transportation method. Hop aboard a boat at Port Orleans Riverside to get to Disney Springs. Ferries serve a number of destinations from the Magic Kingdom. The newest – and cutest! – Disney transportation method is to hop aboard Disney’s Minnie Van service. Minnie Vans are SUVs that hold up to six people painted in Minnie’s classic red and white polka dot pattern. They provide private transportation on demand. Whenever you might use Lyft or Uber, you can now use Minnie Vans. As of summer 2018, Disney’s Minnie Vans now serve any location on Disney property. Travel safely and in style with Disney’s new Minnie Van service. Guests hail Minnie Vans via the regular Lyft app. Although Lyft provides the technology platform for dispatching them, Minnie Vans are entirely Disney run. Disney cast members serve as the drivers and Disney maintains the fleet. At a $25 flat rate, Minnie Vans are a tad pricey. But why might you want to splurge on one? For family travelers, it’s all about the car seats! Disney Minnie Vans come with two Graco 4Ever 4-in-1 convertible car seats. These provide safe travel for children of all ages, from 4 pounds up to 120 pounds. The car seats can rear face, forward face, or work as a highbacked booster. Disney maintains them safely and even trains the drivers on proper installation and maintenance. For parents, the peace-of-mind factor is significant. Related: Do I Need a Car Seat for Disney World? TravelingMom Tip: There are no direct transportation options from one Disney resort hotel to another resort hotel. Those trips require changing buses, usually at a park. Consider taking a Minnie Van if you need to get from hotel to hotel quickly, particularly for early morning character breakfasts. Safe in his Graco 4Ever car seat in booster mode in a Disney Minnie Van. Disney’s transportation system has fairly robust coverage, but many visitors nevertheless prefer the convenience of a car. If you are flying to Orlando, MCO has some of the cheapest rental car rates in the country. Value Resorts: $13 per night. Moderate Resorts: $19 per night. Deluxe and Deluxe Villa Resorts: $24 per night. Off-property visitors should also be sure to plan for parking fees at the theme parks. As of summer 2018, parking at the theme parks is $22 a day (preferred parking is also available for $45). Parking at Disney Springs is free for everyone. Parking is also free if you drive to a Disney hotel to dine. For the convenience of a car without the cost or parking hassles, consider letting someone else do the driving at Disney. Taxis have long been ubiquitous on Disney property, but ridesharing services like Uber and Lyft have taken Orlando by storm the past few years. Get the apps on your smartphone and add your credit card before your trip. Don’t miss TravelingMom’s complete guide to ridesharing in Orlando for all the best tips. Off to Disney in Uber Car Seat in Orlando! If you have a young child of car seat age, families can still use ride-sharing services more safely – even when venturing off-property where Minnie Vans don’t travel. Uber began offering Uber Car Seat service in Orlando in early 2016. This option provides one convertible car seat rental with your car for a small extra fee (approximately $10). The seat types vary but are usually most appropriate for toddlers. Guests from hundreds of different off-property hotels need transit options too. While off-property visitors can use the Disney transportation systems, getting to the parks at the start of the day requires a car or shuttle ride. Disney Springs area hotels like the Wyndham Lake Buena Vista offer their own shuttles to the parks. There are quite a few hotels that offer their own shuttle systems. The Disney Springs area hotels, for example, all share a shuttle system. The Four Seasons Orlando also has a set of dedicated buses to the parks. Before booking an off-property hotel promising park shuttles, do your research first. How often do the shuttles run? Do they cost extra? Do they go to all the theme parks or just the Transportation and Ticket Center? If you are staying off-property on your Disney vacation, be sure to read these transportation tips for off-site hotels at Disney World. As if all these transportation options aren’t enough, there is even more coming. Currently under construction is an ambitious new transit choice – the Disney Skyliner. This gondola system will connect Disney’s Hollywood Studios and Epcot (at the World Showcase exit) to Caribbean Beach Resort, Art of Animation Resort, Pop Century, and the proposed Disney’s Riviera Resort. The exact opening date is still to be determined, but rumors are that it may open in mid to late 2019 and likely prior to the late fall opening of Star Wars Galaxy’s Edge. Leslie Harvey is a former attorney from the San Francisco Bay Area and mom of two kids, ages 8 and 3. She blogs about the joys and challenges of travel with little ones at Trips With Tykes. She has a passion for all things air travel related (well, everything except the TSA) and is also a lifelong Disney geek. She saves money on her family’s travels by maximizing the benefits of airline frequent flyer and other loyalty programs. Sadly parking is no longer free at Disney Resort Hotels starting March 2018. Standard Overnight Parking charges per Resort Category: Disney Value Resorts: $13 per night. Disney Moderate Resorts: $19 per night. Disney Deluxe and Deluxe Villa Resorts: $24 per night. Ferries are my favorite—but the Skyliner gondolas may gain that position! Do the buses go to multiple resorts to pick up people before going to the parks? For instance, if I am staying at Old Key West, can I expect to be picked up and taken directly to Animal Kingdom or should I expect that our bus might stop at Caribbean Beach Resort and elsewhere to get people before going to Animal Kingdom?